When we saw on Phlegm's blog about his first new piece of artwork of 2015 we knew we had to get down to Mosborough to have a look at it ourselves. 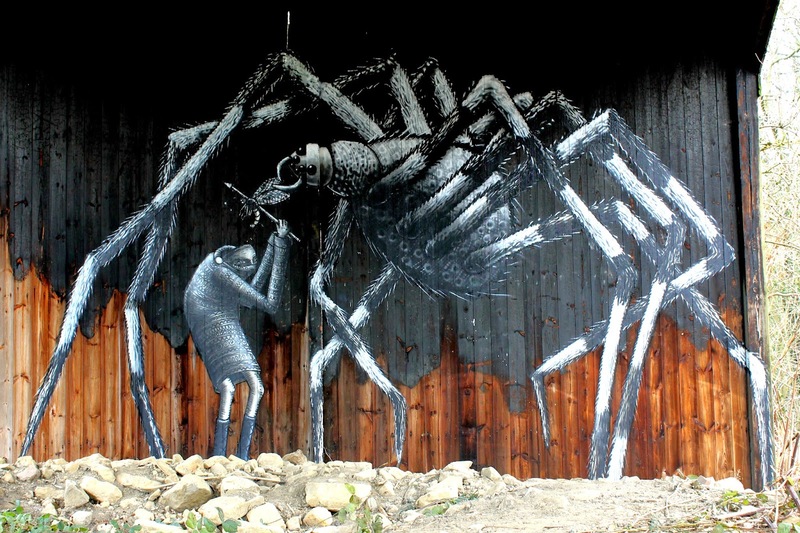 Although Phlegm is known for his street art and urban art this piece, dare we say it, is out in the Sheffield suburbs. In fact it's about as far out as the city's boundary goes as Mosborough lies on the border with Derbyshire. In every other aspect this is a classic Phlegm piece. The setting is a burnt out barn set back on the corner of Station Road and School Street. The monochrome giant spider is battling hard with the familiar long-limbed being. Who will win in the fight for the winged creature? What an interesting piece of art, I bet it was great to see it in person. We had to tread over a lot of brambles to get to it! Phlegm is an outstanding artist. We've got one of his books as well. Wonderful photo, it's not easy to capture street art in an interesting way (well I think). this is an amazing piece of art. i just love street art, especially sculpture but this is fantastic. His work is all over Sheffield but he has travelled he world doing pieces. It's a very unique style.